It’s time to think about getting to work on lawn care chores that are best done in the fall. Overseeding should be near the top of that list. If your lawn needs reseeding, embrace the fact that fall is a great time of year to reseed. September is an ideal month for such a job. It’s still relatively warm, yet the nights will gradually begin to cool down. Make sure you are choosing a lawn seed designed for a cool season. The milder days and cool nights of autumn are perfect for seed germination. Seed can better retain moisture in such conditions. The heat of the summer is gone, meaning those seedlings can thrive in the cooler conditions. Overseeding can help give your lawn a “fresher” look. Overseeding can also help promote growth, especially in older lawns. You can also decide to aerate your lawn before reseeding. Lawn aeration is the process of breaking up the soil in the lawn, allowing water, nutrients and oxygen to penetrate the root zone. This also helps relieve compaction of the soil, caused by heavy use over time. Once this done, it’s time for the overseeding process to begin. Don’t make overseeding more complicated than it needs to be. 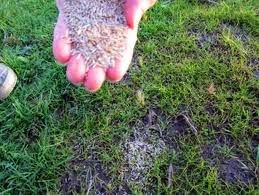 This process can boil down to spreading seed over the existing lawn. This is why it’s handy to have the lawn seed spreader. It’s also a good idea to rake the grass before seeding. Once seeding is down, you can add starter fertilizer. And remember the seeded areas will need water. The seeds need moisture to germinate. Not all lawns require overseeding in the fall, but it’s fair to say overseeding can benefit most cool climate grasses.